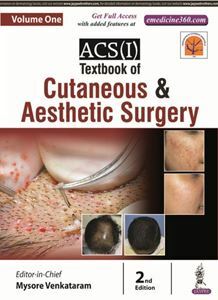 Released first in 2013 and edited by Dr. Venkataram Mysore, Textbook of Cutaneous and Aesthetic Surgery has established itself as the premier textbook and a complete, comprehensive guide on the subspeciality. It has proved to be hugrly popular amongst students and practitioners alike, accross the world. The book is targeted at both the beginners interested in the basic surgical knowledge and experienced cuteneous surgeons who wish to enhance their knowledge and skills. In its second edition, it has now become bigger and grown to include 151 chapters. The continued focus is on four thrust areas: Dermatosurgery, Aesthetics, Lasers and Practice Management under six sections covering all the procedures under these categories. All the chapters have been revised thoroughly and new content added. There are as many 59 new chapters covering new topics, such as body shaping, microneedling RF, new laser and and energy technologies, platelet rich plasma, aesthetic techniques, social media, marketing, and training in dematosurgery and many more. The sections on lasers, energy devices, hair transplantation and tissue augmentation have been expanded significantly. There is an entirely new section on regional surgeries. The book retains its emphasis on topics relevant to the Indian dermatosurgeons and the brown skin, such as detailed sections on vitiligo surgery, chapters on leprosy surgery and pigmentation. The focus continues to be on the reader friendly format. There are almost 2,000 colored images and illustrations. Text boxes, tables, keynotes and pearls are included. Chapter 64 to Chapter 146 available in Volume 2.